The project brief called for 1 main illo, and 5 small spot illos to accompany an article about using an Android device as a mobile entertainment system while traveling. For the main illo, the AD envisioned the interior of a hotel room, television on a dresser, maybe a lamp, some luggage shown for context, with a person sitting on the edge of the bed holding a Wii controller playing a video game. An Android phone and proper adapter shown connected to the TV via an HDMI cable. 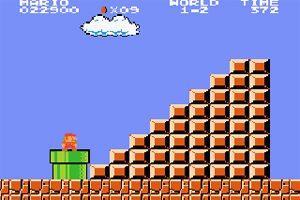 The client also suggested showing on the TV screen an image from the old Super Mario game. The colors were to be 100% cyan for the line work (keeping with our established infographic style for that section) and an orange for an accent color. a) I began by constructing the inside corner of the hotel room in SketchUp. I just needed to show enough of the room and as many details to get across the idea that it was a hotel room. After the SketchUp construction and exporting the line work to Illustrator, I arrived at a simple scene with minimal detail. The only portion of the rough that is not SketchUp is the TV screen image. For this image, I took a PNG screen shot of a generic Super Mario screen. In Photoshop I converted this 4-color image to a duotone using the orange that the client specified. Saved that as a TIF file, placed it into illustrator, and used the Live Trace tool to convert/trace the TIF image to a vector image. After minimal clean-up and color tweak, I dropped this vector image into my Illustrator file and used the Transform tool to manipulate it into place on the TV screen. b) After discussing details of the rough with the client, we were good to go to final. I had no reference photos on-hand of a person sitting on a bed playing a video game, especially from a vantage point that matched the existing perspective in my model. So...a perfect job for my teenage son! With phone and printout of the rough in hand, he sat on our bed holding the Wii controller as I took a couple photos of him. The perspective in the photos wasn't a perfect match, but were surprisingly close to my model. I placed and sized the photos in Illustrator, and traced Drake. c) I exported from the model the line work and fills from different components separately, because I wanted to control the rendering process without everything being in a single, compound group. I then constructed the final using the various exports, coloring and registering the components methodically. Dropped in the drawing of Drake, rendering and sizing accordingly. Added some color to the phone screen to bring attention to it....and also added a pizza box and a couple cans of soda to give the scene a more 'lived-in' feel. Just for fun, I added a pattern to the bedspread in the orange tones. Helps add some visual interest to the piece, and helps 'sit' Drake on the bed. I created the pattern in Illustrator based upon a 60's wallpaper pattern. I dropped the vector pattern into the file and adjusted it with the Transform tool to fit the perspective of the bed. d) It was a wrap. The ADs and editors were very pleased with the final result. In the end, it isn't enough to simply render a pretty picture. The most effective illustrators often have to be equal parts researcher, idea incubator, photographer, observer, 3D modeler, technician, and artist to pull all of the necessary ingredients together to make an illustration sing.